Milk chocolate will be best choice if you prefer a smoother chocolate intensity. Roll out the pastry on a lightly floured surface to a 4mm-thick disc. 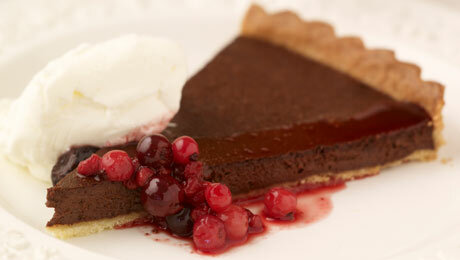 Line the pastry in a round 3cm-deep 23cm (base measurement) fluted tart tin with removable base or individual tart tin. Place in the fridge for 30 minutes to rest. Line the pastry case with non-stick baking paper or cling film and fill with pastry weights or rice. Remove the paper and pastry weights or rice. Reduce oven temperature to 160°C/325°F/Gas Mark 3. Place the chocolate, cream and cocoa powder in a medium bowl over a simmering saucepan of water over a low heat. Stir the mixture frequently for 5 minutes or until the chocolate melts and the mixture is smooth and just warm. Add the eggs and liqueur and combine. Pour the chocolate mixture into the pastry case. Bake in a preheated oven for 10 -12 minutes or until just set. Remove from the oven, Set aside for 3-4 hours to cool. Meanwhile, heat the berries with lemon juice and caster sugar in a pan until bubbling and add the liqueur, tilt the pan sideways to ignite the berries. Remove from the heat and leave to cool down. To serve place the berries into the centre of the tartlet and a dollop of cream.